Heating Services - Air purifier, gas furnaces, humidifier and dehumidifier, rooftop heater, UV lights, and whole house filter media. Air Conditioning Services - Air conditioners, air filters, cooling system design, central air systems and rooftop air conditioners. 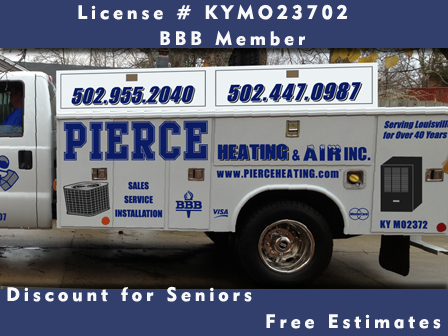 Contact Pierce Heating & Air Inc today at 502-447-0987 or 502-955-2040, or browse the website for more information about our products and services.